Metal fans of the world unite! Today – June 6th – is every metal fan’s public holiday. Ok, the public holiday is still in the works, and this post is a little late, but it is at least a day when all metal fans can proudly proclaim their faith in all things heavy. To represent all that is metal, the band Slayer have been adopted as the international symbol of metal music. Slayer is a band from California. Their music has come to epitomise speed metal music in the latter half of the 20th century. Their 1986 album, “Reign in Blood” is one of the single most influential metal albums of all time, typified by the modern classic “Angel of Death”. Playing “Reign In Blood” has been positively correlated with reductions in the local infestations of hippies, fundamentalist religious groups and other non-savoury people. 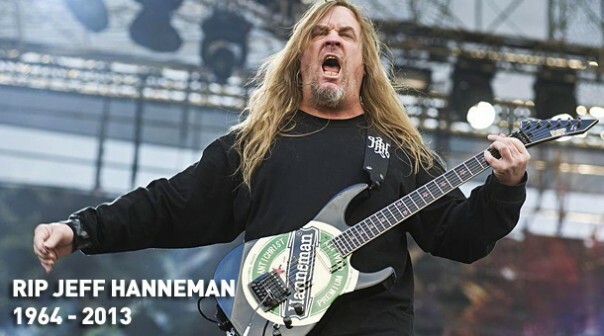 This year the International Day of Slayer takes on greater significance due to the death of Slayer’s guitarist, Jeff Hanneman. DO NOT use headphones! This year find a way to make the music of Slayer even louder, in honour of Jeff. The objective of this day is for everyone within earshot to understand that it is the International Day of Slayer. International holidays aren’t just about celebrating; they’re about forcing it upon non-participants. Stage a “Slay-out.” Don’t go to work. 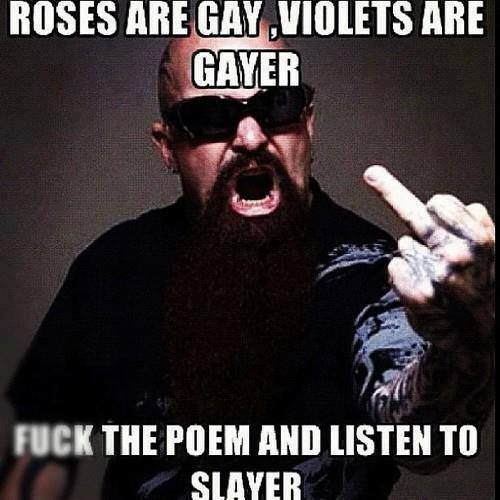 Listen to Slayer. Kill the neighbour’s dog and blame it on Slayer. You could admit yourself to hospital, as you are clearly ill.
You could take this opportunity to grow to like Slayer. You could listen to all of your favourite metal albums whilst watching a Slayer video. You could admit that you aren’t really a metal fan and kill yourself in shame or hang out with Justin Beiber fans (same thing really). Previous Previous post: Good News Everyone! Next Next post: Pulse Pounding Tales is here!